Rakett participated at MC Messa – An art fair for artist run spaces and collaborations anno 2007, initiated by Members Club (Kjersti Vetterstad, Sveinung Unneland, Linn Pedersen and Monica Winther). 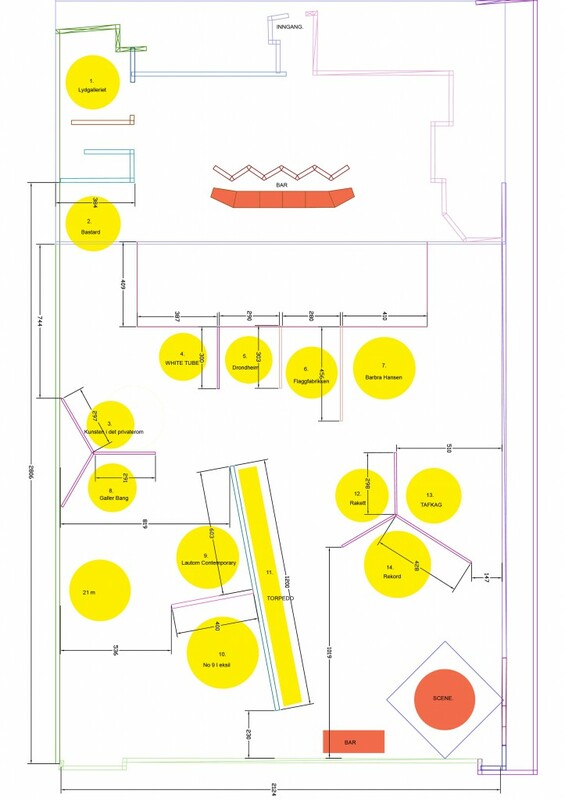 Map of participants, MC Messa – An art fair for artist run spaces and collaborations anno 2007. MC Messa was inititated as an art fair for artists-run spaces and galleries that aimed to gather and showcase the young Norwegian art scene. The background was an attempt to copy and play with the commercial aspects of the art fairs’ heavy economical frames. Rakett did not want to use the occation to reproduce these structures of the art field with the focus on sale and branding of artists’ work, but rather use the opportunity to raise questions around production and display and open up the processes of different artistic practices and methods. 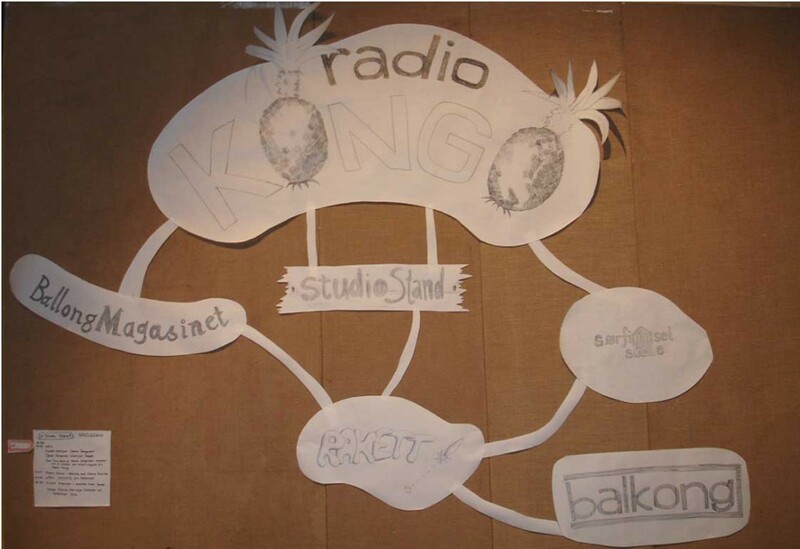 In collaboration with Søssa Jørgensen from Ballongmagasinet, Rakett initiated and enacted Radio Kongo – Studio Stand, a live radio studio that during three hours was established and presented a program consisting of a combination of live interviews and pre-recorded material that was locally live-transmitted in the building of the art fair. 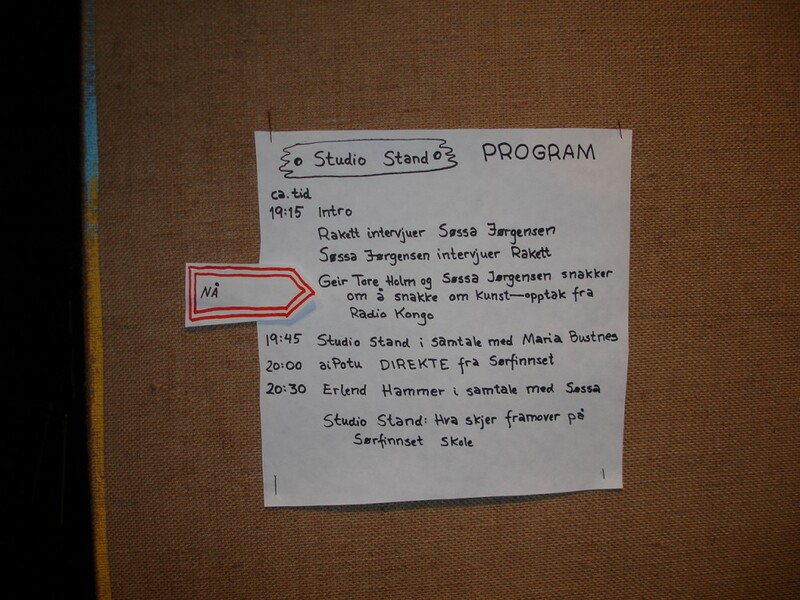 The Studio Stand, was a studio-satellite to the existing Radio Kongo which is the local radio broadcasted on the FM net in the village of Sørfinnset, Gildeskål in the north of Norway. The radio channel is regularly activated as a part of the ongoing project Sørfinnset Skole/the nord land, which is partly run by Jørgensen in collaboration with Geir Tore Holm, Rirkrit Tiravanija and Kamin Lertchaiprasert. 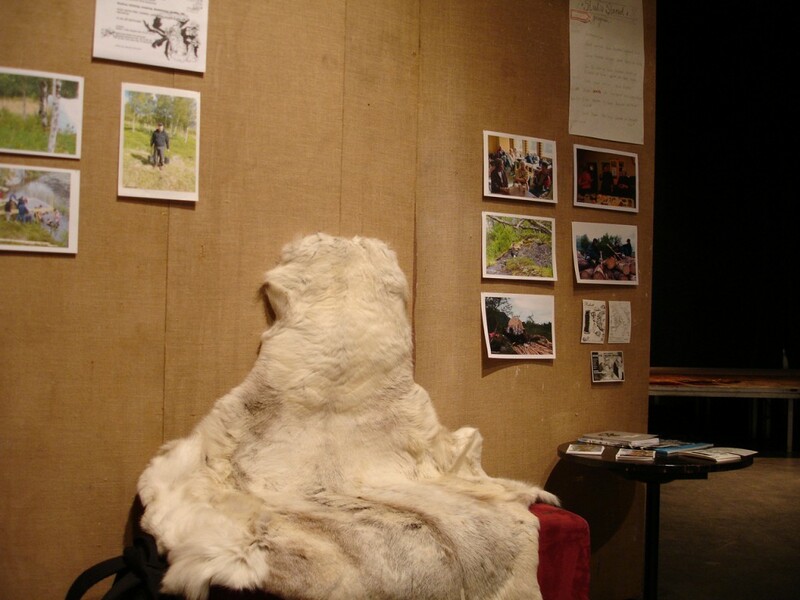 Studio Stand: What will happen in the future for Sørfinnset Skole/the nord land? Conversation between Camila Marambio, Rakett and Søssa Jørgensen. Søssa Jørgensen er billedkunstner og har kuratert utstillinger og prosjekter, med spesiell interesse for lyd-kunst og sosial-kunst. Hun er co-redaktør i lydkunstprosjektet Ballongmagasinet. For tre år siden begynte hun på et langvarig samarbeide omkring den nordnorske kystbygda Sørfinnset, i Gildeskål, Nordland, med prosjektet Sørfinnsetskole/ the nord land, sammen med Geir Tore Holm. Et lokalt engasjement, som er internasjonalt gjennom tilknytning til the landfoundation i Chiang Mai, Thailand. Hun studerer i den forbindelse til en master i Landskapsarkitektur ved UMB, Universitetet for miljø og biovitenskap på Ås. Ballongmagasinet (co-run by Søssa Jørgensen and Yngvild Færøy) has provided sound to public space since 1996, seeking ideal production and screening venues for sound-art. 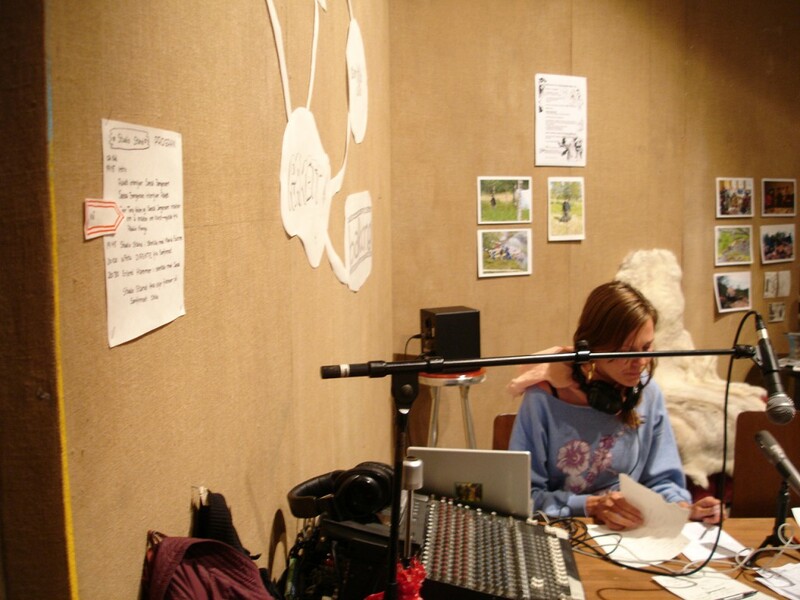 First known as a weekly radio programme about sound-art, at Radiorakel, on the local FM band in Oslo. During three years, four young artists presented around 200 artists, who in some way included sound in their artistic practise. In 1999 Ballongmagasinet created the website www.ballongmagasinet.com, presenting sound works accompanied with images, both historical and contemporary, international and local – catchy, narrative, noisy and playful. They joined forces with NIFCA to launch HELIUM, a net project in which curators from the extended Scandinavian area were invited. In 2003 they collaborated with NRK and Notam for the project Blind Film, and participated at the Nordic Pavilion at the Venice Biennial with Electric Leak – the North of it. Ballongmagasinet works with sound installations, (very) local radio broadcasts, sound walks, and a listening lounge containing examples of Ballongmagasinet’s wide definition of sound-art, including text sound compositions, noise, field recordings, concrete music, audioplays, radio documentaries and experiments.